Growth; Growth Failure; Systemic Lupus Erythematosus; Corticosteroids. The aim of this study was to evaluate the growth pattern in children with cSLE by longitudinal serial anthropometric measurement to identify growth failure. In addition, we sought to identify possible factors that may affect the growth in children with cSLE including disease activity, disease duration, and cumulative steroid dose. We studied all cSLE patients who followed-up at Sultan Qaboos University Hospital, one of the two pediatric rheumatology centers in Oman, between 2007 and 2015. The study included Omani patients who were diagnosed with SLE before 12 years of age and were followed in our clinic regularly for at least two years. All the patients fulfilled at least four of the American College of Rheumatology (ACR) 1997 revised criteria.6 Patients who were lost to follow-up, transferred to adult care, or were not regularly followed-up at scheduled assessments were excluded from the study. Patients in whom we were not able to obtain measurements for both parents heights were also excluded from the study. Ethical approval to conduct the study was obtained from the local ethics committee. Parents’ heights were measured, with self-reported heights accepted. Parental heights were used to calculate the child’s target height. This was calculated by adding 6.5 cm to the mean parents’ height for males and subtracting 6.5 cm for females. Continuous outcome variables such as BMI z-scores and height deflections were screened for outliers using the Box-Cox plot, while categorical variables were screened using frequency distributions. In addition, the impact of risk factors over time was analyzed using the generalized estimating equations (GEE) method using exchangeable correlation structure. As there were many parameters, the risk variables were analyzed one variable at a time using the GEE method. Data was analyzed using SPSS Statistics (IBM Corp. Released 2011. IBM SPSS Statistics for Windows, Version 20.0. Armonk, NY). We evaluated a total of 61 patients (47 female, 14 males) with cSLE. Out of the initial cohort of 61 patients, we were able to complete the data collection for 25 patients with cSLE (20 females and 5 males). The patients that were excluded included those lost to follow-up/transferred to adult rheumatology service (n = 30) or had incomplete parental height measurements (n = 6). The demographic characteristics of our cohort of cSLE patients are described in Table 1. The clinical manifestations were arthritis (84.0%), lupus nephritis (40.0%), mucocutaneous (38.0%), hemolytic anemia (33.0%), thrombocytopenia (17.0%), pulmonary involvement (13.0%), cardiac involvement (10.0%) and leukopenia (10.0%). The patients were treated with prednisolone and hydroxychloroquine (98.0%), azathioprine (57.0%), mycophenolate mofetil (49.0%), cyclophosphamide (38.0%) and rituximab (10.0%). Growth failure, defined as parent-adjusted height z-score < -1.5, at study entry was observed in seven patients (female: male ratio, 5:2). However, at the end of the study period, growth failure was observed in eight patients (female: male ratio, 7:1) with overall incidence 32.0% (95% CI: 13.7–50.2%). The female incidence of growth failure was 35.0% compared to the male incidence of 20.0%. However, the difference was not statistically significant (p = 0.915). All girls with growth failure at study entry continued to have growth failure at 24 months, while two girls with normal growth at study onset developed growth failure at 24 months. There was an improvement in growth at the end of the study period in one boy. Table 1: Baseline characteristics of 25 patients with systemic lupus erythematosus (Mean ± SD). SD: standard deviation; BMI: body mass index; CI: confidence interval. Factors that might have contributed to growth failure (such as previous growth failure at disease onset, severity disease activity at the time of diagnosis, disease duration, and cumulative steroid dose) were compared between patients with and without growth failure. The most significant factor that determined future growth failure was the pre-existence of growth failure (z-score < -1.95 vs. 0.35; p < 0.001) at the time of diagnosis. Another important contributing factor was the cumulative steroid dose with the highest dose being consumed by the patients who had growth failure (15.8 vs. 9.1 g; p = 0.061). On the other hand, disease duration tended to be longer among the growth failure group (5.4 vs. 3.7 years; p = 0.240). Differences in severity of disease activity at the time of diagnosis measured by SLEDIA was not found to contribute significantly to growth failure as the SLEDAI score in the two groups were comparable (12 vs.14; p = 0.529). Figure 1: Mean parental adjusted z-score by gender and follow-up. The longitudinal anthropometric characteristics of our cohort measured by parent-adjusted height z-score are represented in Table 2 and Figure 1 . Girls had a significantly higher parental adjusted height z-score compared to boys at baseline (-0.3 vs. -1.2; p = 0.050). Over the study period, the boys’ parent-adjusted height z- score improved compared to the girls’. However, the girls’ parent-adjusted height z-score continued to decline throughout the study period with an average mean decline -0.16 (95% CI: -0.01–-0.31). Other risk factors affecting parent-adjusted height z-score such as age at diagnosis, disease duration, and disease activity were not statistically significant [Table 2]. There was no significant correlation between cumulative steroid dose and the parent-adjusted height z-score at 24 months. Table 2: Parent adjusted and body mass index (BMI) z-scores by time of follow-up and risk factor. SD: standard deviation; SLEDAI: systemic lupus erythematosus disease activity index. Figure 2: Mean body mass index z-score by age at diagnosis and follow-up. The BMI z-score characteristics of our cohort of cSLE patients is described in Table 2 and Figure 2. Children whose age at diagnosis was < 5 years had a higher BMI z-score compared to children whose age at diagnosis was ≥ 5 years (0.3 vs. -1.6, 95% CI: 0.057–0.541). There was a significant difference between the two groups in the mean BMI score over time (p = 0.030). 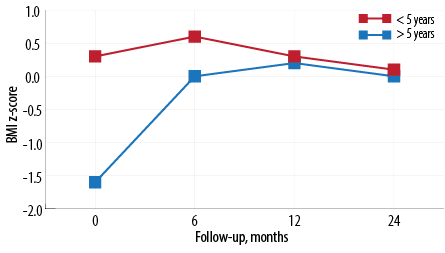 However, the difference was insignificant at 12 months follow-up; both groups reached a similar mean BMI z-score [Figure 2 and Table 2]. Other risk factors affecting BMI score (gender, disease duration, and disease activity) were not statistically significant [Table 2]. There was no correlation between cumulative steroid dose and BMI z-score. The overall incidence of height deflection was 65.2% (95% CI: 45.7–84.6). The incidence at six, 12, and 24 months was 52.0%, 65.2%, and 53.8%, respectively. The mean height deflection z-score at six, 12, and 24 month assessment was -0.3, -0.3, and -0.4, respectively [Table 3]. Although there was a trending decline in height deflection, there was no statistically significant difference between the specified time periods (p = 0.711) most likely due to the small sample size. Table 3: Height deflection by time of follow-up and study variables. On average, boys had significantly higher height deflection (0.237, 95% CI: 0.11–0.44; p = 0.001) compared to girls. However, after six months the difference between the genders was stark. Boys’ height deflection z-score started increasing while the girls’ started to decline rapidly. Risk factors such as age at diagnosis, duration of disease, and SLEDAI score were not significantly associated with height deflection [Table 3]. Similarly, there was no correlation between height deflection score and cumulative steroid dose at 24 months. The Systemic Lupus International Collaboration Clinics (SLICC)/ACR Damage Index (SDI) was developed to measure irreversible damage in adult SLE, and has been validated for cSLE.12 However, growth failure is an important measurement of disease damage in cSLE and was recently added as a domain to pediatric SDI.13 In general, growth failure is experienced in 15% of patients with cSLE.5 In our cohort, growth failure was identified in 32.0% of patients, significantly higher than other studies which could be attributed to the small sample size. Previous studies on growth failure demonstrated the potential for catch-up growth in children with cSLE once the doses of corticosteroids were reduced and/or the disease was better controlled.14 A longer term study would be needed to evaluate the evidence of catch-up growth in our cohort. In addition, patients who experienced growth failure in our cohort had a longer disease duration compared to patients who did not develop growth failure (5.3 years vs. 3.7 years, respectively); however, this was not statistically significant. The association of growth failure with longer disease duration has been well described in the literature, but in our study, this association was not statistically significant due to the small sample size.21,22 Finally, the severity of disease activity at disease onset, measured by SLEDAI, did not contribute to the development of growth failure in our cohort. Perhaps measurement of the total duration of active disease throughout the study period was a more important determinate on growth. Unfortunately, in our study, disease activity was only evaluated at disease onset and we did not evaluate the total duration of active disease. Height deflection and parent adjusted z-score were analyzed longitudinally over 24 months. Rygg et al,15 observed that females with early onset disease had a marked reduction in height deflection most pronounced within the first year of the disease with little catch-up growth resulting in a higher proportion of growth failure and height deflection in prepubertal age females than males. This observation was also noted in our cohort of patients. Females had better parental height adjusted z-score at disease onset. However, their height score declined continuously throughout the study period with little catch-up growth. On the other hand, males had a lower parental adjusted height score at disease onset. However, there was catch-up growth after six months resulting in similar parental adjusted height z-score at the end of the study in both genders. We acknowledge the limitation of the study, which included its retrospective nature. The small sample size of the study might have affected the results with underestimation of some associations. In addition, it would have been useful to routinely investigate all patients diagnosed with cSLE with underlying growth failure at disease onset for other comorbidities such as coeliac disease. However, these investigations were only performed on clinical grounds, and they were not performed routinely to detect subclinical presentations of the disease. The survival rates in cSLE have improved greatly over recent decades. Increased life expectancy means that more children are growing up with greater damage as a consequence of chronic disease and prolonged therapy. Growth failure is an important determinant of disease damage in cSLE. Patients at risk of growth failure were those who had growth failure at the onset of disease, a higher cumulative steroid dose, and longer disease duration. Assessing disease and therapy complications have become an important outcome measure in which we can evaluate the quality of life. Longitudinal prospective studies are needed to examine the relative change in health status, disease activity, and damage over time to improve health-related quality of life in children with cSLE. 1. Kamphuis S, Silverman ED. Prevalence and burden of pediatric-onset systemic lupus erythematosus. Nat Rev Rheumatol 2010 Sep;6(9):538-546. 2. Klein-Gitelman M, Reiff A, Silverman ED. Systemic lupus erythematosus in childhood. Rheum Dis Clin North Am 2002 Aug;28(3):561-577, vi-vii. vi-vii. 3. Hiraki LT, Benseler SM, Tyrrell PN, Hebert D, Harvey E, Silverman ED. Clinical and laboratory characteristics and long-term outcome of pediatric systemic lupus erythematosus: a longitudinal study. J Pediatr 2008 Apr;152(4):550-556. 4. Levy DM, Kamphuis S. Systemic lupus erythematosus in children and adolescents. Pediatr Clin North Am 2012 Apr;59(2):345-364. 5. Ravelli A, Ruperto N, Martini A. Outcome in juvenile onset systemic lupus erythematosus. Curr Opin Rheumatol 2005 Sep;17(5):568-573. 6. Hochberg MC. Updating the American College of Rheumatology revised criteria for the classification of systemic lupus erythematosus. Arthritis Rheum 1997 Sep;40(9):1725. 7. de Onis M, Onyango AW, Borghi E, Siyam A, Nishida C, Siekmann J. Development of a WHO growth reference for school-aged children and adolescents. Bull World Health Organ 2007 Sep;85(9):660-667. 8. Growth Hormone Research Society; GH Research Society. Consensus guidelines for the diagnosis and treatment of growth hormone (GH) deficiency in childhood and adolescence: summary statement of the GH Research Society. J Clin Endocrinol Metab 2000 Nov;85(11):3990-3993. 9. Grote FK, Oostdijk W, De Muinck Keizer-Schrama SM, van Dommelen P, van Buuren S, Dekker FW, et al. The diagnostic work up of growth failure in secondary health care; an evaluation of consensus guidelines. BMC Pediatr 2008 May;8:21. 10. Bombardier C, Gladman DD, Urowitz MB, Caron D, Chang CH; The Committee on Prognosis Studies in SLE. Derivation of the SLEDAI. A disease activity index for lupus patients. Arthritis Rheum 1992 Jun;35(6):630-640. 11. Tanner JM, Goldstein H, Whitehouse RH. Standards for children’s height at ages 2-9 years allowing for heights of parents. Arch Dis Child 1970 Dec;45(244):755-762. 12. Hiraki LT, Hamilton J, Silverman ED. Measuring permanent damage in pediatric systemic lupus erythematosus. Lupus 2007 Aug;16(8):657-662. 13. Gutiérrez-Suárez R, Ruperto N, Gastaldi R, Pistorio A, Felici E, Burgos-Vargas R, et al. A proposal for a pediatric version of the Systemic Lupus International Collaborating Clinics/American College of Rheumatology Damage Index based on the analysis of 1,015 patients with juvenile-onset systemic lupus erythematosus. Arthritis Rheum 2006 Sep;54(9):2989-2996. 14. Bandeira M, Buratti S, Bartoli M, Gasparini C, Breda L, Pistorio A, et al. Relationship between damage accrual, disease flares and cumulative drug therapies in juvenile-onset systemic lupus erythematosus. Lupus 2006 Aug;15(8):515-520. 15. Rygg M, Pistorio A, Ravelli A, Maghnie M, Di Iorgi N, Bader-Meunier B, et al; Paediatric Rheumatology International Trials Organisation (PRINTO). 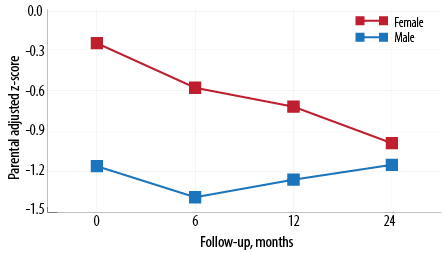 A longitudinal PRINTO study on growth and puberty in juvenile systemic lupus erythematosus. Ann Rheum Dis 2012 Apr;71(4):511-517. 16. Dahan S, Shor DB, Comaneshter D, Tekes-Manova D, Shovman O, Amital H, et al. All disease begins in the gut: Celiac disease co-existence with SLE. Autoimmun Rev 2016 Aug;15(8):848-853. 17. Donatti TL, Koch VH, Takayama L, Pereira RM. Effects of glucocorticoids on growth and bone mineralization. J Pediatr (Rio J) 2011 Jan-Feb;87(1):4-12. 18. Mushtaq T, Ahmed SF. The impact of corticosteroids on growth and bone health. Arch Dis Child 2002 Aug;87(2):93-96. 19. Blodgett FM, Burgin L, Iezzoni D, Gribetz D, Talbot NB. Effects of prolonged cortisone therapy on the statural growth, skeletal maturation and metabolic status of children. N Engl J Med 1956 Apr;254(14):636-641. 20. Saha MT, Verronen P, Laippala P, Lenko HL. Growth of prepubertal children with juvenile chronic arthritis. Acta Paediatr 1999 Jul;88(7):724-728. 21. Sato JO, Corrente JE, Saad-Magalhães C. Chronic active disease pattern predicts early damage in juvenile systemic lupus erythematosus. Lupus 2015 Nov;24(13):1421-1428. 22. Ravelli A, Duarte-Salazar C, Buratti S, Reiff A, Bernstein B, Maldonado-Velazquez MR, et al. Assessment of damage in juvenile-onset systemic lupus erythematosus: a multicenter cohort study. Arthritis Rheum 2003 Aug;49(4):501-507. 23. Lilleby V, Flatø B, Førre O. Disease duration, hypertension and medication requirements are associated with organ damage in childhood-onset systemic lupus erythematosus. Clin Exp Rheumatol 2005 Mar-Apr;23(2):261-269. 24. Johnson W, Soloway LE, Erickson D, Choh AC, Lee M, Chumlea WC, et al. A changing pattern of childhood BMI growth during the 20th century: 70 y of data from the Fels Longitudinal Study. Am J Clin Nutr 2012 May;95(5):1136-1143. 25. Rogol AD, Clark PA, Roemmich JN. Growth and pubertal development in children and adolescents: effects of diet and physical activity. Am J Clin Nutr 2000 Aug;72(2)(Suppl):521S-528S. 26. Sinicato NA, Postal M, Peres FA, Peliçari KdeO, Marini R, dos Santos AdeO, et al. Obesity and cytokines in childhood-onset systemic lupus erythematosus. J Immunol Res 2014 Mar;2014:162047.